The housing crisis is deepening at a startling pace, with the rate of price rises picking up dramatically. Prices in February were up almost 11pc when compared with last year, new Central Statistics Office figures said. 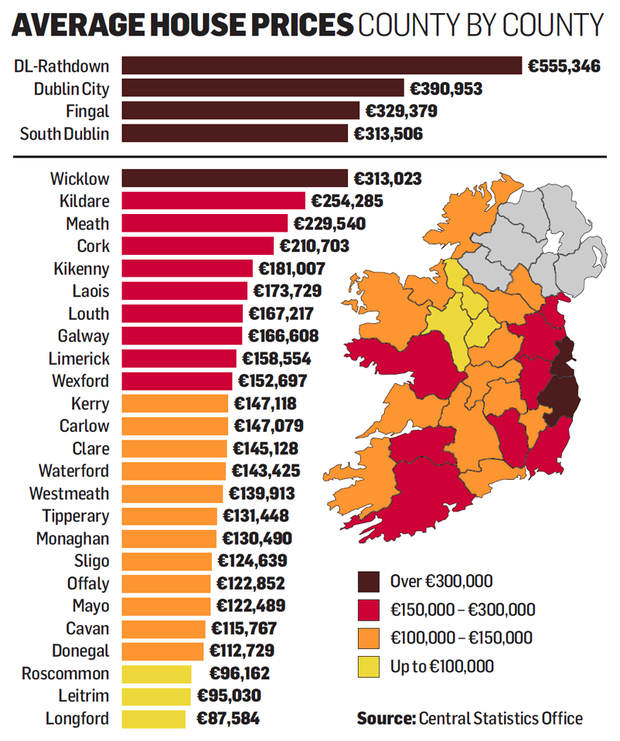 It was the first double-digit rise since 2015, and the largest rises were outside Dublin, although in the capital average prices are now circa €400,000. The surge in prices is expected to continue this year with the finances of first-time buyers turbo-charged by the Government's Help-to-Buy scheme. The Help-to-Buy tax rebate for first-time buyers and a loosening of the Central Bank's lending rules have been blamed for stimulating demand at a time of chronic supply shortages. The lowest growth was in Fingal, with house prices rising just 3.7pc, the CSO said. The combination of the 90pc lending limit for first-time buyers, combined with the 5pc Help-to-Buy rebate and 2pc cash-back paid by some lenders, means some new buyers can get a mortgage of up to 97pc of the property's value. However, housing experts said the sharp rise in prices was likely to make it more expensive for new buyers in the coming year, especially in urban areas. Some 5,222 buyers have applied for tax rebates under the Housing Minister Simon Coveney's Help-to-Buy scheme. A quarter of purchases were by first-time buyers last year, but this is expected to rise sharply this year with the Help-to-Buy scheme in place. More than half of the houses bought last year were by movers, with a quarter bought by what are classified as non- occupiers. Economist with Davy Stockbrokers Conall Mac Coille said he now expected prices for the year as a whole to be up more than 10pc. "The key uncertainty is how much extra momentum to Irish house price inflation has been added by the Help-to-Buy scheme and the loosening of the Central Bank mortgage lending rules. "The sharp gains in the early part of 2017, when price rises are normally muted, indicate that our forecast for 10pc house price inflation might even be too pessimistic." The Institute of Professional Auctioneers and Valuers (IPAV)said prices would keep rising this year. IPAV chief executive Pat Davitt said construction levels were being constrained by an inability of smaller builders to access finance, and at reasonable interest rates. He also blamed a lack of competition in the lending market, and what he claimed was over-restrictive lending rules for second-time buyers. KBC Bank economist Austin Hughes said prices were set to keep rising this year. Merrion analyst Alan McQuaid said a lack of supply of houses had pushed up prices, particularly in the Dublin area. Nationally, prices are 31pc below the peak they reached in 2007.